Want a Special Pack Discount? ( Special Pack comes with a spatula ): 2 Mask Sets & 1 Hydrix Ampoule at $25.99 No. Thanks. This is a true high end spa quality mask. This unisex product is suitable for any age group all year round, especially for those skin with lack of vitality and tone. 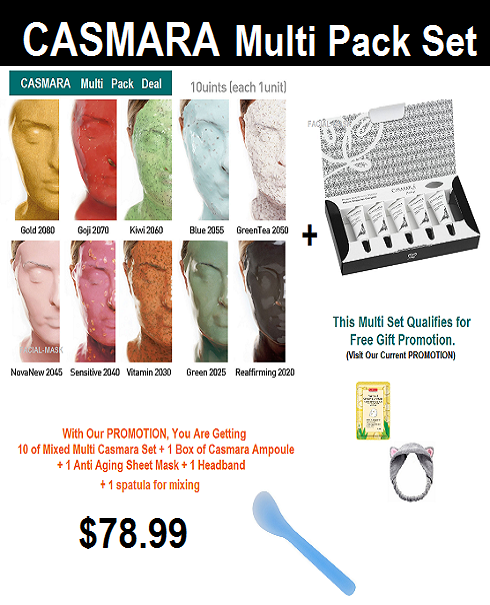 This unique Algae Peel-Off Facial Mask sets facilitate the penetration of the active ingredients contained in the mask,and the ampule applied to the skin. Casmara mask can also be applied over the eyes and on the lips and other treatable areas on your face, which can easily be neglected by the other face mask brands. It dramatically reduces the temperature of your skin by up to 6ºC, providing a skin tightening effect, rejuvenation, reduced puffiness and the reduction in enlarged pores. A purchase of 10 sets or more on same item gets an extra 10% discount. 1. After cleaning your face apply ampoule ( preferably Casmara ampoule ) to all over face. 2. In the bowl, place powder and gel, mix well to make it a paste for 30 seconds. 4. Peel it off from your face after about 20minutes later. It should come off very easily and you do not have to rinse your face after. 5. Follow with your regular skincare regime. This mask makes my face feel and look younger every time I use it.